As pubs in the Republic of Ireland lifted a 90-year ban on serving alcohol on Good Friday, Northern Ireland’s ‘archaic’ licensing laws yesterday came under fire. Ulster Unionist MLA Andy Allen said the province’s hospitality sector was being held back by restrictive liquor rules. Mr Allen said: “Whilst issues around alcohol licensing laws are not just restricted to Easter opening hours, it is at this time of year when Northern Ireland’s archaic rules are most evident. In Northern Ireland, pubs can open on Good Friday but may only serve alcohol between 5pm and 11pm. 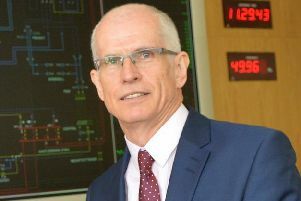 Earlier this week, Hospitality Ulster CEO Colin Neill said that Northern Ireland’s “out of date” licensing laws could cost up to £20 million in lost revenues - and that the relaxation of the laws in the Irish Republic were set to make the situation worse. Cross walk organised by Pastor Jack McKee of the New Life City Church. Good Friday 2018. But Pastor Jack McKee, of the New Life City Church in Belfast, took a different view. He added: “Christians have nothing to do with the pubs being closed. We don’t set the laws. Yesterday, Pastor McKee completed the 40th day of carrying a wooden cross around Belfast’s peace walls. The pastor’s aim is to “lift the cross above the gun and above drugs in our communities, and showing there is a better way”. Over the border in the Republic, queues formed outside pubs as a 90-year ban on serving alcohol on Good Friday was lifted. Some punters eager to experience the novelty of ordering a pint on the holy day were lined up outside early opening bars from 7am. In what was set to be a long and productive day for hostelry owners, many pubs were buzzing throughout Friday morning as revellers reaped the benefits of the law change. Publican Brian Conlon, of Slattery’s Bar on Capel Street in Dublin city centre, was one of the first to pull a legal Good Friday pint at 7am on Friday morning. “It was busier than usual this morning, when I opened up at 7am there were queues at the front door,” he said. He said many of the punters were tourists from places such as England, Spain and Germany who arrived in Dublin and needed to wait until lunch to check-in to hotels. “They are all in having pints, they are all having breakfast – that option wouldn’t have been there last year, so I think it’s a great thing,” he said. Mr Conlon said his staff were happy to work on what previously had been a day off. Slattery’s regular Jim Croke welcomed the lifting of the ban. “It’s very good, it’s great for tourism and it’s good for the country,” he said. The move came after years of campaigning from a hospitality industry infuriated at the annual lost revenue opportunity at the start of the Easter bank holiday weekend. Some Christian campaigners remain opposed to legislation that won the support of all parties in the Dail. The Intoxicating Liquor Act of 1927 also banned drinking on St Patrick’s Day in Ireland - March 17. But that ban was lifted at the outset of the 1960s. There were some exceptions to the 90-year Good Friday ban - alcohol could be served to hotel residents; those travelling by air, rail or sea; or people attending a theatre show or a sporting event such as greyhound racing.